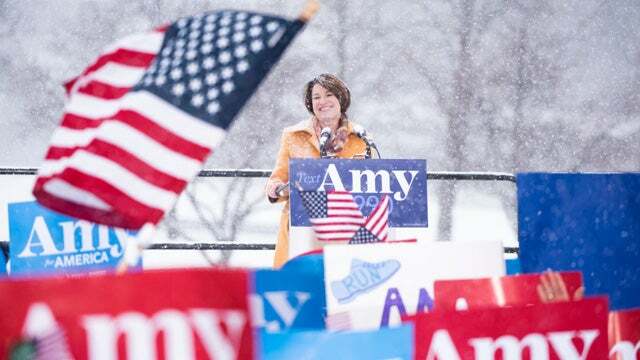 Who Told Amy Klobuchar She Has a Snowball’s Chance in Hell? RUSH: CNN keeps showing this video of Amy Klobuchar announcing her -- look at that. It is a blizzard, and she's talking about global warming. Trump is right. It happens every time. Every time Gore goes out and does some meeting on global warming there's a snowstorm or an ice storm. And she's standing there, her hair is getting white. If Trump were there he'd at least be wearing a hat in this thing, but it is a whiteout. And I sit here and I wonder, who is it that told Amy Klobuchar that she has any chance whatsoever of being elected president? There's any number of people about whom you could ask that in this entire Democrat lineup. Now, the minute that she announced, here came stories about what a b-i-itch that she is to her staff. Have you seen those stories? She is mean as she makes them pick up her dirty clothes. She makes them do her dishes. She makes them recharge her iPad and iPhone, and if they don't, they get an earful. I mean, it is menial, really insulting kind of stuff. It's the kind of stuff insecure people who end up as bosses, how they start treating people who work for them. You can always tell about a person's character by watching how they treat people that can't do anything for 'em, who can't advance them. And this woman apparently is so bad that Dingy Harry back in 2015 had to call her in for a meeting to tell her to back off of her own staff. So she was being interviewed about this, and her excuse, "Well, you know, I have high expectations of everybody. I high expectations of myself, I have high expectations of my staff." Well, we all do. I mean, a lot of people -- well, actually a lot of people don't. And if that could be changed, that would be wonderful. We have the soft bigotry of low expectations that are extended to practically every minority. I mean, if the Democrat Party wants to put you in a group of a bunch of victims, then you can't say they have very high expectations of you. If they've got low expectations, if they look at you and see that you're nothing, that you can't do anything on your own, you can't do it without them, well, that's low expectations, the soft bigotry of low expectations, which is then used to validate victim status and then validate taking care of people, even those unwilling to work, as it did, say, in the talking points, the summary of Alexandria Ocasio-Cortez, the Green New Deal. But who told this woman that she has a chance? Now, I know that Nate Silver who was the polling wunderkind for the Democrat Party has worked up a piece how she could win and particularly in Iowa. But I think they're all smoking something. "But, Rush, but, Rush, don't be too quick to judge because this is exactly how they reacted to Donald Trump." Yeah, well, if you're gonna do that then you're gonna have to find a favorable of comparison Amy Klobuchar to Donald Trump, and you can't. Nobody knows who she is, outside of Minnesota, number one. Everybody knew who Donald Trump was. And his likability, Trump’s likability was off the charts before he became a candidate. Only then did Trump become this gigantic ogre and white supremacist and white nationalist. Tucson's Most Stimulating Talk is on KNST AM 790. Southern Arizona's home for Garret Lewis, Rush Limbaugh, Sean Hannity and Glenn Beck. Listen live on our free iHeartRadio app.